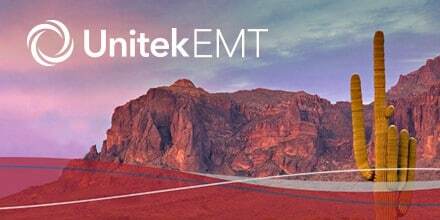 Unitek EMT has expanded their popular Emergency Medical Technician training program into Chandler, Arizona. Based in California, Unitek seeks to provide Arizona residents with an accelerated and robust option for their EMT training. Currently, Unitek is accepting students for boot camps scheduled to start in October at their Chandler campus. In Arizona, the Unitek EMT program features a 14-day boot camp with applied training, hands-on exercises, and clinical simulations. Students will receive efficient and comprehensive EMT training through this 140-hour program. The 10 hours of boot camp style instruction per day for 14 consecutive days is designed to simulate the intense pace of work that can be expected on the job as an EMT. The program also includes NREMT passing assistance. The National Registry of Emergency Medical Technicians (NREMT) administers the cognitive certification exam that graduates must take in order to become nationally certified EMTs. At a student’s request, Unitek will provide assistance in passing this milestone exam. “Due to the vital service that first responders provide, there is great demand for well-trained EMTs across the country,” said David Higley, Chief Marketing Officer at Unitek Learning, the parent company of Unitek EMT. “Our new Chandler campus will serve the entire Maricopa County area.” With almost 5 million people, Maricopa is the fourth most populous county in the U.S., and it was the fastest-growing county in 2017. Last year, the average salary for EMTs and paramedics in Arizona was $38,330 according to the Bureau of Labor Statistics, which makes Arizona one of the nation’s top ten highest-paying states for EMTs and paramedics. To make their graduates more marketable, Unitek offers psychomotor skills training that meets the requirements of various EMS and public safety agencies. They currently provide successful graduates with a Program Completion Certificate. Through the Arizona EMT program, Unitek seeks to promote student excellence, strengthen support for workforce development, and help fill the need for EMS professionals in the United States. For the past 12 years, Unitek has provided aspiring EMTs with the training they need to succeed. Their state-of-the-art courses and boot camps equip graduates with the current theory and technique for first-response treatment of patients. Taught by seasoned EMS professionals, the classes at Unitek EMT include realistic simulations, hands-on training, and one-on-one instruction to ensure students master the skills they’ll need to save lives. By submitting this form, I agree that Unitek EMT may call and/or text me about educational services at the phone number provided, including a wireless number, using automated technology. This consent is not required to attend our institutions. You may call us directly at 888-790-1458.